The Korean Peninsula needs "A light of peace" as tensions there escalate again, and on Sunday Dec. 3, the World Council of Churches launches a campaign for a north Asian region and a world free of nuclear weapons. Canadian pastor's release comes as US-North Korea tensions ease: but where does China fit in? It is the first Sunday of Advent when Christians worldwide begin a period of sacrifice in preparation to celebrate the birth of Jesus. The WCC's social media campaign invites people all over the world to extend "A light of peace" for the Korean peninsula and the world. "The situation on the Korean peninsula continues to be tense," says WCC general secretary, Rev. Olav Fykse Tveit as peace-lovers scramble to find diplomacy as a means of deescalating tensions in the region. "As a Christian fellowship we must raise our voices against nuclear proliferation and express our solidarity with peoples living under the threat of armed conflict," he said. The campaign will be accompanied by common prayers for justice and peace for the peoples of Korea soon after North Korea launched a powerful new missile that landed in Japanese territorial waters. The campaign will coincide with the Nobel Peace Prize Award Ceremony in Oslo on the 2nd Sunday of Advent, Dec. 10, when the WCC's longtime partner, the International Campaign to Abolish Nuclear Weapons (ICAN) will receive the award. "Lighting candles and sharing prayers through social media sends a strong message of peace and solidarity from people around the world. It is an excellent opportunity to show unity and make our voices heard," says Tveit. "So, please join us in prayers and in social media in our journey for justice and peace." The campaign aims to revive public awareness about the unstable and dangerous situation on the Korean peninsula and the threat that nuclear weapons pose. The National Council of Churches Korea will from 3 to 9 December hold a candle-light prayer gathering at Seoul's Gwanghwamun square early each evening. Churches in South Korea will also hold prayer gatherings from Dec. 3 to 7 and on Dec. 9 at the YMCA in Seoul. The campaign seeks to raise public awareness about the peace-building role of the Churches and WCC's support of eliminating nuclear weapons. For decades the world has tightened sanctions against North Korea, but its campaign to be a nuclear power has proliferated. In a statement on Nov. 22, the WCC, however said, "While celebrating new steps taken towards global elimination of nuclear weapons, the Executive Committee also fears the cycle of confrontation on the Korean peninsula might slide into nuclear warfare." In a previous statement on Aug. 9, the WCC spoke out against sanctions, which are viewed as counterproductive, running counter to the U.S. administration of President Donald Trump who seeks to ramp up sanctions perennially in quest that still shows no results. 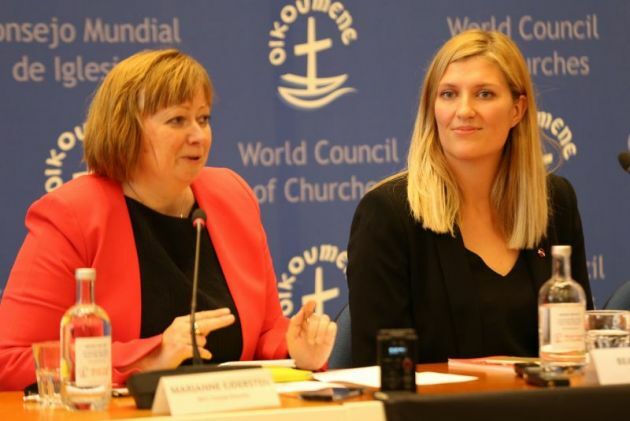 The WCC urged the international community to instead adopt measures which can contribute to creating the necessary context for dialogue and a constructive defusing of tensions on the Korean peninsula.